When it rains, it pours. I wish that statement were in reference to the weather (Georgia desperately needs water), but it’s more ab0ut life right now. Needless to say, I wish I hadn’t eaten/shared all of these scones by today–I could have used a pick-me-up! Being the holiday season and all (Christmas for me), I have a carton of Silk Nog in my fridge and I’d eyed a vegan eggnog muffin recipe, but I didn’t really want to make muffins. Since I’d made date scones before (at the bakery), I figured I could substitute the eggnog for the soy milk, add a few extra spices, and have tasty eggnog chocolate chunk scones. Combine the the flour, baking powder, sugar and spices in a mixing bowl. Cut the Earth Balance into the dry mix until a coarse crumb forms. Stir in the chocolate chunks. Make a well in the center of the flour mixture and pour in the vegan eggnog. Mix in, then work together with well-floured hands to make a soft dough, then form into a ball. If the dough is too sticky, work in a little more flour. On a well-floured board, roll the dough out into a 1/2-inch thick round. Place on a floured baking sheet and with a sharp knife, cut into 8 wedges halfway through the dough. Bake for 15 to 20 minutes, or until golden on top. :O bookmarked! there’s no way I would get through a whole carton of soynog by myself, and those scones look wonderful. 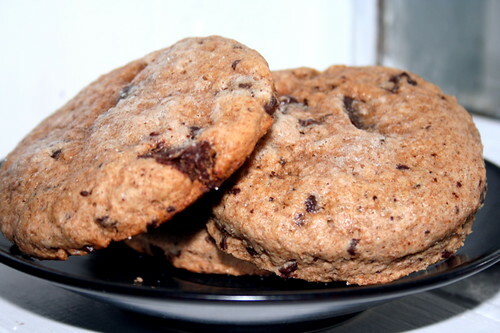 my goodness, these Vegan Eggnog Chocolate Chunk Scones look/sound so indulgent and delicious!! I do hope that everything gets better for you Jes!! Hang in there!! I don’t, but you could take your favorite muffin recipe and substitute the vegan eggnog for the non-dairy milk! Hope that helps!